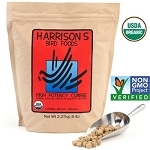 FOR USE IN BIRDS - after completing a dietary program of High Potency Formula for a period of at least 6 months. 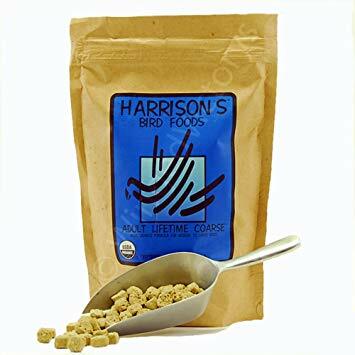 - as a year round maintenance formula that meets the nutritional requirements for healthy, non-breeding birds including pionus, Amazons, cockatoos, macaws and other medium to large parrots. 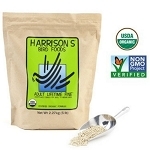 Ingredients: *Ground Yellow Corn, *Ground Hulless Barley, *Ground Soybeans, *Ground Shelled Peanuts, *Ground Shelled Sunflower Seeds, *Ground Lentils, *Ground Green Peas, *Ground Rice, *Ground Toasted Oat Groats, *Ground Alfalfa, Calcium Carbonate, Psyllium, Montmorillonite Clay, Spirulina, Ground Dried Sea Kelp, Vitamin E Supplement, Sea Salt, Vitamin A Supplement, Vitamin D3 Supplement, Niacin Supplement, Vitamin B12 Supplement, Riboflavin Supplement, d-Calcium Pantothenate, Pyridoxine Hydrochloride, d-Biotin, Thiamine Mononitrate, Sodium Selenite. 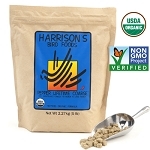 *CERTIFIED ORGANIC INGREDIENT Guaranteed Analysis: Crude protein (min.) 15%, crude fat (min.) 5.5%, crude fiber (max.) 6.5%, moisture (max.) 10%. Harrisons to the rescue again for me. This time, my yellow collared macaw chewed (not pulled) all his feathers in two days. This is a 16 year old bird who has been in perfect feather all his life. I immediately switched to Harrisons from the home made people grade organic food I was giving him and he stopped chewing and all his feathers are growing back now. I thought his diet was very good, but something must have been missing. 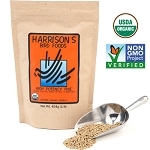 Harrisons also takes less time to prepare so a win-win on all counts. Readily accepted by my Amazon. My bird has been on this for several years now, and we always have a good check up at the vets. Excellent customer service, great communication and fast shippingWonderful to do business with. Q: I would like to buy 1 case of 6-1 lb bags, but I don't see this option. Can I still purchase this package? A: Simply add 6 to the shopping cart - we do not offer a "case" price.